I was mostly raised in East Texas and it’s been a long time since I took a history class in school, so I can’t remember everything I was taught about the Civil War and Reconstruction. 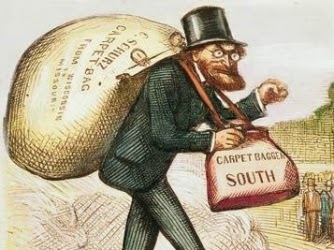 But one thing I can be sure of – up until a few years ago, if we were doing word association and you asked me what came to mind in response to the word “Reconstruction,” I would have most likely said “carpetbaggers.” And yes, this would definitely be the image in my mind of what that word represents. The racist applications were never made explicit, but the message was clear…those “outside agitators” (a term that was popularized during the second reconstruction) came down from Yankee-land to exploit the South for their own financial gain. That’s what defined the era of Reconstruction in my classrooms. It was that “ink and pen” that wrote the history about Reconstruction that I learned growing up…the history that so subtly kept me ignorant of what ignited the terrorism African Americans were subjected to over the next hundred years in this country. As I continue to learn from people like Varon, the pieces of the puzzle come together and the picture of what really happened starts to take shape. It is in that process that I also begin to understand the place where we find ourselves today.